If your Mid-South business operates machinery or commercial vehicles to get the job done—especially those in the steel mill, landfill, forestry, or waste management industry—it’s important to have an individualized fire protection system for your vehicles. At State Systems, Inc., we offer vehicle fire suppression services in the Mid-South area—including Tennessee, Arkansas, and Mississippi. Call us today or contact us online to schedule an estimate on a fire suppression system for your commercial vehicle or fleet of machinery. Engine Compartment – The engine compartment contains fluids, fuels, oils, and greases, all very near to high heat sources. Battery Compartments – Battery compartments are a serious potential fire hazard when combustible material builds on top of the battery. Transmission, Torque Converters, and Parking Brakes – These are all a potential high heat source that could cause combustible materials to ignite. High Pressure Hoses – A ruptured high pressure hose could also be an ignition source. 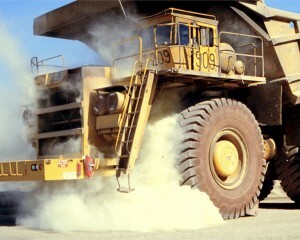 Industrial vehicles are plagued with potential fire hazards and burn at an alarming rate. These fires pose a serious and grave threat to operator safety and can also disrupt business operations and productivity. Industrial vehicle fire protection systems require regular inspection and strict maintenance in accordance with NFPA 121, NFPA 17, and the manufacturers’ installation manual. Our highly skilled and trained technicians can inspect and service all types of vehicle fire suppression systems for businesses located in the Mid-South. 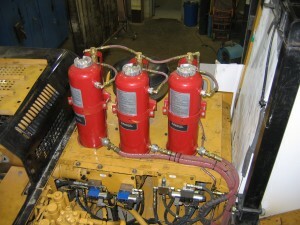 We also offer installation, inspection, repair, and replacement services for fire suppression systems designed for other vehicles within the mining, transportation (including commercial transit buses, rail and port machines, and railway track and structures), power generation/utilities, agribusiness, and aviation industries. To find out more about the vehicle fire suppression services we offer, or for a quote, contact us or call 866-308-5701.